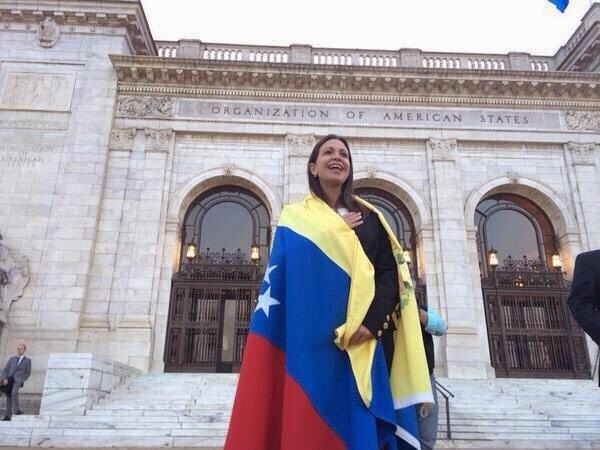 Despite having the right to speak, blocked and banned from the Organization of American States, and singing the National Anthem, Maria Corina Machado exposed the realities of having "petroamigos" at the highest levels, by not allowing her to speak for more than half of people in her country, Machado exposes the Venezuelan dictatorship. Is my duty as parliamentary react to Resolution No. 2014, issued by UNASUR foreign ministers in Santiago meeting in Santiago, Chile, this March 12. Finally UNASUR decided to issue a statement to, after more than thirty long days of serious conflict in Venezuela, to protect the regime, not the Venezuelans. In over a month of peaceful democratic protest there are 25 dead, over 300 injured, over 1,300 arrested and 40 documented cases of torture. I consider extremely seriously that UNASUR has not made any reference to the brutal repression by the Venezuelan regime. Not a word to the murdered of citizens by death squads paid and supported by the government, or the students massacred by paramilitary groups, arrests without warrants, torture, although everything is fully recorded and disseminated through social networks and international media. We are still waiting in that the UNASUR Parliament fulfill the commitment made on 19 April 2013, to promote a review of our presidential elections, then denounced as fraudulent. Nicolas Maduro has violated each of its commitments, and UNASUR with its silence and inaction has validated all his actions. The resolution UNASUR / RSMC No. 2014, is a disgrace and contrasts with the announcement made yesterday by a large group of Latin American parliamentarians, which will accuse Nicolas Maduro for crimes against humanity before the International Criminal Court in The Hague, for the cruel and inhuman repression exercised since 12 February. Chancellors of UNASUR, is obligatory to think before endorse a regime that massively and systematically has violated human rights and has made the repression and torture a state policy . We agree with UNASUR, his concern for the independence and sovereignty of Venezuela, for that reason we repudiate the Cuban interference in our security agencies, intelligence and identification and demand the immediate expulsion of the Cuban military in our national armed forces. Please share this video !! Thank you! !